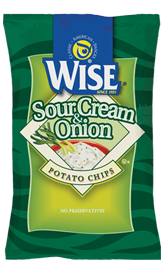 Wise are one of the biggest and most established Chips companies in the world. Their bag designs will understandably have a bit of a corporate feel. The flavors are color coded, with nice shaded areas to compliment the colors. The Wise logo has shrunk and altered over the years but it is highly visible, recognisable and very well designed. The rotated square is original and not copied. The image of the pot of Sour Cream with the scallions hanging out of it seems a little awkward. These were not as thin and crispy as some regular Chips. They had a good crack when snapped, but it was a light tinny sound, rather than a firm break. The crunch was similar. A mouthful quickly turned to potato pulp. A large bag was poured in a bowl and we found mostly whole Chips on the small to medium size. There was a fair amount of browning and some brown edges that may have featured potato skin. A finger residue was created by the flecky seasoning mixed with the grease. A Nose Plunge Test revealed a slight onion aroma. The taste was a bit salty creamy potato with a hit of onion. It wasn't a sweet onion, but the combo worked well. It is nice when a pairing in a flavoring combo combines and this did.